Yesterday was a long day; up at 6.30 AM and not back to the Yatoo Centre till 12 midnight. 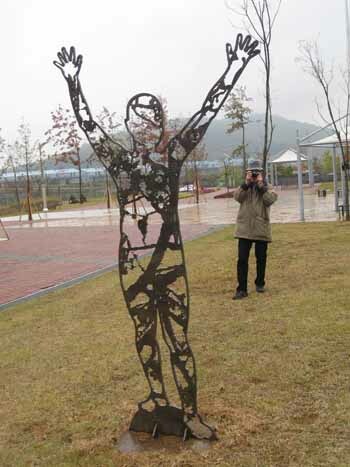 Artists associated with Yatoo Korean Nature Artist’s Association have recently installed sculptures at the Dorsan Peace Park near the de-militarized zone (DMZ) which has separated North from South Korea for the almost 60 years. Owing to genuine hostility between the North and the South, large numbers of troops are still stationed along both sides of the line, each side guarding against potential aggression from the other side. The armistice agreement explains exactly how many military personnel and what kind of weapons are allowed in the DMZ and soldiers from both sides patrol inside this area. It was an overcast day with frequent thunder, lightning and rain squalls. Our mood was not helped by the fact that we had to surrender our passports and wait in the bus for over an hour before driving off towards the DMZ through vast stretches of razor wire each side of the road. It appears that soldiers from the North have dug a number of tunnels over the years aimed no doubt at moving troops and weapons to the South for surprise attacks. On a clear day North Korea is visible away in the distance across the DMZ. 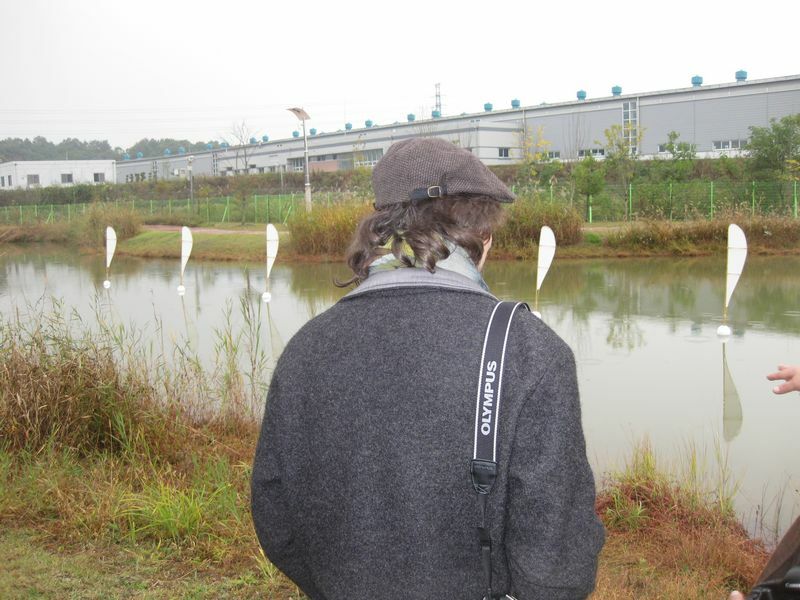 Believe it or not but the DMZ has become a sanctuary for wild life. Life plays some strange tricks; civilised people are not safe in this place but wild creatures are! We departed from the DMZ leaving behind the many tourist coaches, souvenir shops and tunnel walkers and headed for the Dorsan Peace Park. We gathered to listen to an ensemble of music students playing waltzes which added to the sense of occasion. I figure they played the waltzes as a reminder of bygone days. We sheltered from the rain as all those present were introduced and the artists made short speeches. 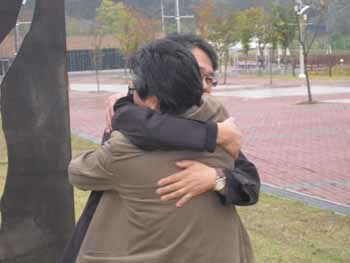 Kang, Hee-joon has seldom embraced his brother stranded in North Korea which made his work especially poignant. A human scale figure cut out from a sheet of steel leaving a space. The cut out figure was placed some metres away. 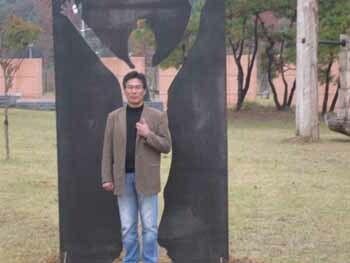 The artist and one of his fellow Korean artists stood in front of the sculptures and when the urge took them both raced towards each other to embrace, like brothers. 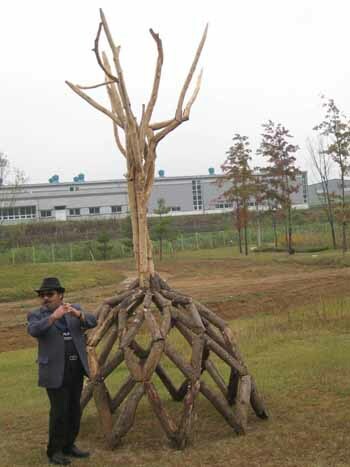 Hur, Kang from Korea worked with natural timber taken from a tree and skilfully reassembled it symbolising how life will grow from the field of sadness. Pawel Chlebek Odebek from Poland created a powerful piece in cast concrete. A human form is struggling to be free from the ties that bind. The pain is so great that his chest splits open revealing a heart bound in barbed-wire. We in the South can feel their pain and pray for the madness that divides this beautiful country to end so the families and the country can be reunited. Roger Tibon from the Philippines created a ‘work in progress’. 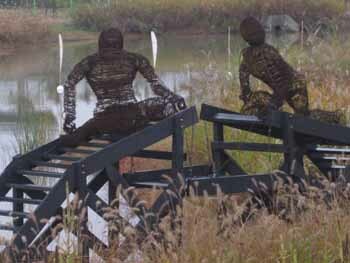 Two figures crouch on a partially made metal bridge. 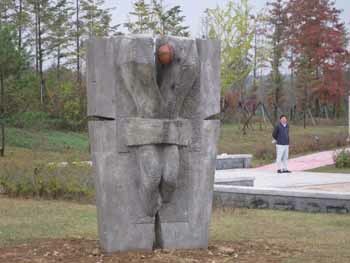 They labour to raise the final piece which when it is placed in the middle will bridge the gulf between the two sides. And Roger Rigorth from Germany offered seven beautifully crafted bamboo and white cloth wing-like sails. As the wind gusted the sails danced in-line in a shallow pond near the entrance to the park. The sails appear to wave and send greetings of joy to all Koreans. This was a day where the weather matched our mood. It was also a day when artist sought to rally in support of freedom.